Not so long ago, food was just food. That’s not the case anymore. Food is now politics and ethics as much as it is sustenance. At least that’s the impression you get from what’s written and said about food culture – that it has become a form of surrogate politics. And to some, it’s not a surrogate at all; it’s the real deal, politics at its most urgent and consequential. In a world where economic and social issues are ever more intertwined, the global pupulation is seven billion and rising and in a time when climate change is on everyone’s minds, every single choice we make about food matters, at every level. The Anderlecht Abattoir is a place deeply shaped by all of these challanges. Food is thus becoming a concept, an abstraction and a pretext for promoting social and cultural change. The gap created by the loose connections between production and consumption has created a void of meaning that needs to be filled. This is the case in cities more than anywhere else, where food distribution is now mediated by large “non-places”, as the anthropologist Marc Augé has dubbed locations like supermarkets and chain stores. Yet there are still places where we can observe food in all its forms and study its contemporary reincarnations. 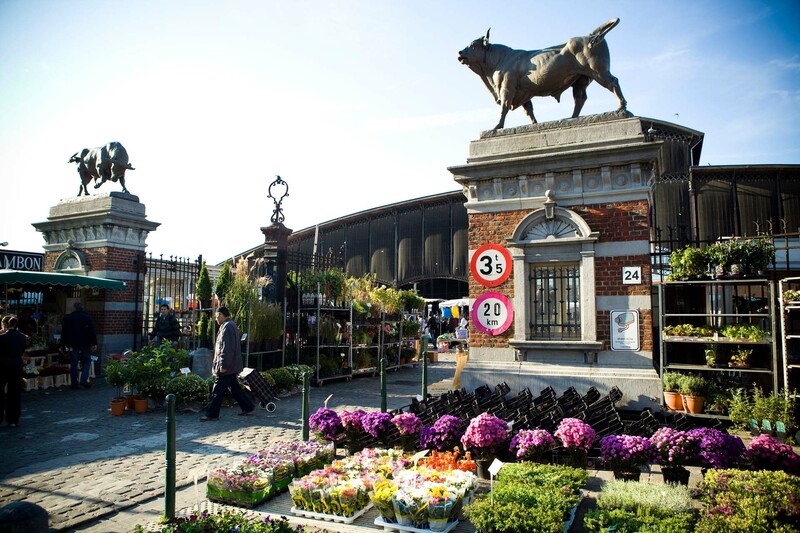 The Anderlecht Abattoir in Brussels, the last centrally located abattoir in Europe, is one of them. 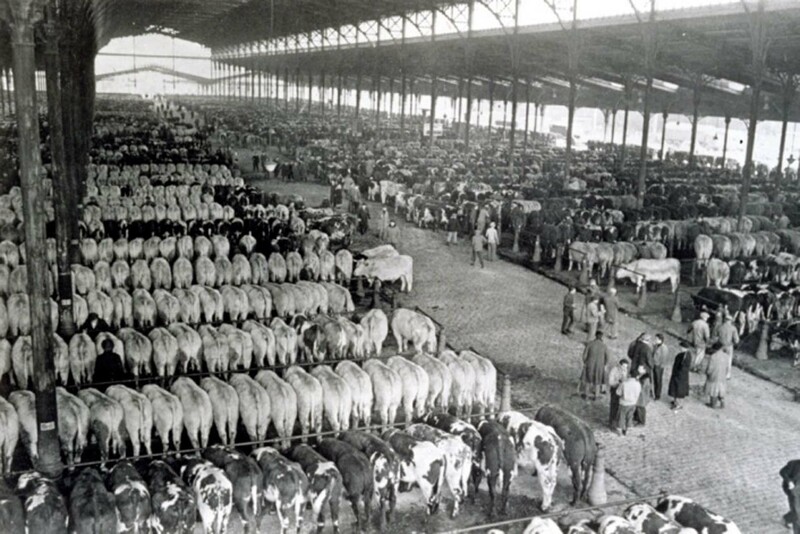 Built in 1890, the Anderlecht Abattoir’s arched steel construction, supported by cast iron pillars, was still used until recently as an open-air abattoir. But since changes in regulations and various protests organised by animal rights associations such as Gaia, this function was relocated to an adjacent building on the same site during the 1990s. These changes haven’t undermined the societal role of the abattoir but actually intensified it. Its covered hall is now a marketplace, a hub for informal economic, social and cultural interactions. It is simultaneously the most important shopping area for the poor migrant population of Brussels, the home of a one-star Michelin restaurant and host to an abundance of sub-saharan car dealers and ethnic food stores. Its complexity makes it hard to describe as a simple “market”. The building’s activity has always been closely related to the Anderlecht neighbourhood that surrounds it, which for several decades was an area of transit and gateway to the city for new migrants seeking to improve their socio-economic situation. The neighbourhood took the brunt of the effects of de-industrialisation: an increase in the rate of unemployment, urban degradation, cohabitation problems, a feeling of insecurity and an increase in school drop-out rates. Moreover, it was also largely ignored by the municipal authorities, as the inhabitants are often seen as dangerous and undesirable. The site of the Anderlecht Abattoir in particular has been under constant pressure to transform and has thus been the subject of many planning visions for the Brussels region. Some plans even suggest that the slaughterhouse and market should disappear completely. Now that the Brussels pentagon is expanding, the abattoir site is becoming all the more important within the city. The pressure for the area to sustain community and work is constantly growing as Brussels gradually spreads into the direction of Anderlecht. This makes the Anderlecht Abattoir a place of negotiation for the changes and conflicts in the area. The current masterplan for its revival offers a potential solution to unite them all under the same roof. Alexander D’Hooghe from architecture and urban planning studio Organization for Permanent Modernity envisioned the site as a white canvas with flexible functional areas in which its users can project their ideals and usage patterns. His 2011 proposal for the Anderlecht Abattoir is a vision but also a political statement for the sites of 150 small private owners. The masterplan projects an interesting future for ways to house food production and distribution, but also raises the question of how market pressure might be detrimental for its current users. 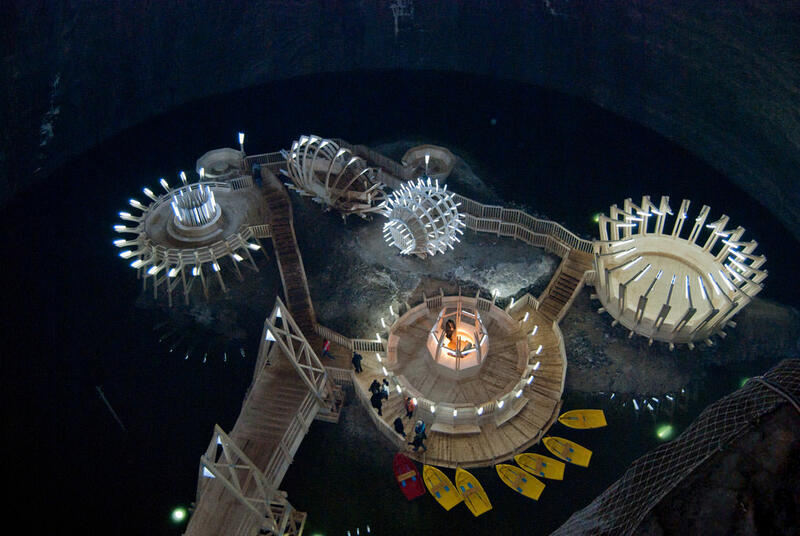 The future development, which will be realised in several steps, is projected to finish in 2020, although it heavily relies on EU funding and grants from the region. 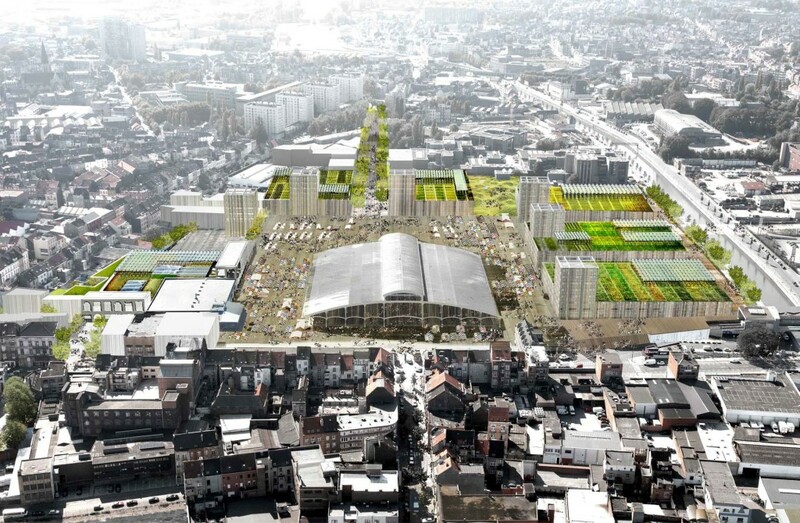 It comprises of a new fresh food market with local shops, an urban farm with a restaurant serving food produced on site, a new residential area based on a concept of the Community Land Trust and other mixed uses developed in close collaboration with local stakeholders, including the Free University of Brussels situated close by. Most importantly, it will keep its current function as an abattoir. At the moment the food hall, also designed by Organization for Permanent Modernity, is in the advanced stages of construction and is projected to become operational by mid-2015. In the meantime, Eva Baerdemaeker and Yannick Roels with their tiny cultural association, Cultureghem, are working on the socio-cultural content of the abattoir. The asphalt under the huge canopy of the slaughterhouse market has recently become a huge, colourful drawing, a kind of crazy mix between the floor plan of a board game and of a sports hall, the Ketmet, where neighborhood children can play on weekdays. The place becomes the site for their Kookmet project on the weekends, which focuses on healthy eating and meeting. This way a whole mix of different people go shopping together, cook together and eat together and while everyone wants to put the site on the big agenda their actions seam to have a real positive impact on the local community. 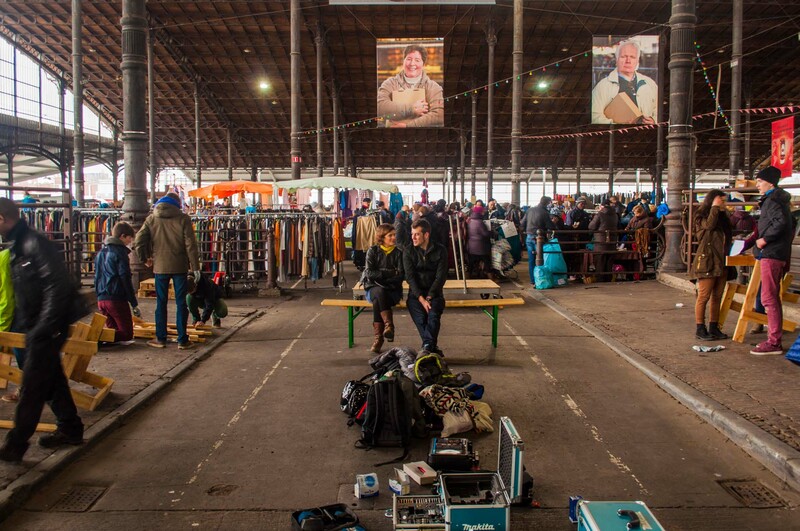 The future of the Anderlecht Abattoir market will be the result of the countless interactions that it facilitates: between private and public, formal and informal, local and global, low and large scale. In the end, it’s not just food.